This appears to be one of Imagic's earlier catalogs, although we suspect there's an even earlier version out there. 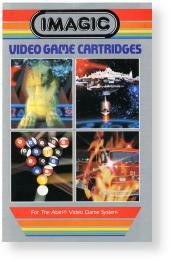 This catalog features Imagic's first seven titles as well as Imagic's Video Storage Center that allowed you to store your 2600 or Intellivision console with games. There's also an offer to join Imagic's Numb Thumb Club, which promised a poster, wallet card and the first issue of Numb Thumb News.